Gulf Coast box turtles can live in a variety of habitats within their range. They often venture into shallow water to feed on insects and amphibian larvae. As with other North American box turtles, Gulf Coast box turtles hibernate when it is colder, but in warmer parts of their range, they may not need to hibernate. They are found along the Gulf Coast region from western Florida to eastern Texas. The Gulf Coast box turtle is larger than other box turtles, with a domed shell that is usually dark brown or black, with few markings. Radiating yellow markings may be found on juveniles, but these often disappear in adults. Males usually have red irises and longer, thicker tails than the females. In addition, the plastron is sometimes concave in males and flatter in females. These turtles are shy and don't like to be handled. In captivity, as in the wild, they need plenty of places to hide, and regular exposure to unfiltered sunlight to ensure they stay healthy. While it is possible to keep Gulf Coast box turtles (especially hatchlings and juveniles) in a large indoor terrarium (most aquariums are too small), they do much better in outdoor enclosures where the climate is agreeable. Most experts recommend a minimum of 4 feet by 8 feet for a box turtle's pen, especially if you have multiple turtles or it is a full-time home. A smaller pen will suffice if space is limited, but avoid going below 4 feet by 4 feet. 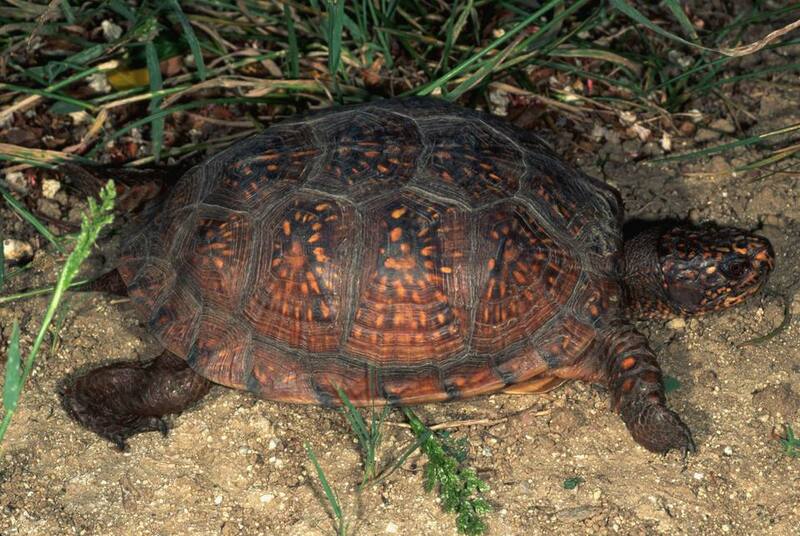 If a box turtle feels cramped it may get stressed, which could cause health problems. Ideally, your box turtle's enclosure will be in a sunny location. While you want your turtle to get plenty of late morning and early afternoon sun, make sure there are shady areas as well. Most box turtles are burrowers, so think about making your pen escape-proof, with the side walls of the structure buried deep into the ground. It's best to build the enclosure out of solid material; if the turtle doesn't see what's outside its cages, it's less likely to try to climb or burrow out to get there. Concrete paving stones placed on the ground around the perimeter of the enclosure may help discourage digging. If you're keeping your Gulf coast box turtle indoors, a terrarium with a heat source is the way to go. You'll want to get a UVB emitting reptile light and provide a basking spot with temperatures between 85 and 88 degrees. Night time temperatures should not drop below 70 degrees. You also should provide an easily accessible shallow pan of clean water at all times, and regularly mist their pen or run a sprinkler for added humidity. Adult Gulf Coast box turtles are omnivores and need a varied diet. Their diet should be about 40 percent vegetables, fruit, and grasses, with the rest made up of low-fat protein sources such as earthworms, slugs, snails, mealworms, crickets, grasshoppers and small fish. Hatchlings and juvenile turtles are more carnivorous than adult turtles, so bear in mind your turtle's age when preparing its meals. It's particularly important to make sure your Gulf Coast box turtle gets the right calcium and phosphorous balance in its diet, to prevent metabolic bone disease. Dark leafy greens such as parsley, dandelion greens, spinach and collard greens all are good vegetable options; blueberries, grapes, apples, and papaya are good fruit choices. You can include other fruits and vegetables in moderation. Fresh and natural prey insects from pet stores and bait shops are the best protein sources for a box turtle. Avoid feeding a captive Gulf Coast box turtle insects caught outside, because you have no way of measuring pesticide exposure. Crickets, earthworms, grasshoppers, beetles, mealworms, wax worms, superworms, and snails all are good insects for turtles to eat. Other proteins to include in moderation are, small chunks of cooked meats and moistened, high quality, low-fat dog food. Typically, the box turtle diet pellets are only meant as supplements to a complete diet. In addition, it is probably wise to dust the turtle's food with a well-balanced reptile calcium and multivitamin supplement at least a couple of times a week. In addition to metabolic bone disease, which can lead to weakened bones and death, Gulf Coast box turtles are prone to respiratory infections, usually caused by insufficient humidity. Symptoms include wheezing and mucus around the mouth and nasal passages. If your turtle suffers from frequent respiratory infections, it could be a sign of vitamin A deficiency, usually caused by a diet that is not rich enough in vital nutrients. Parasitic infections are another common ailment seen in turtles. These don't always show symptoms but will show up in an exam by a veterinarian who specializes in reptiles. And like most turtles, box turtles are susceptible to a painful condition known as shell rot, caused by a bacterial or fungal infection. The shell will appear cracked or dry and may emit an unpleasant odor. If your turtle is showing symptoms of any of these illnesses, don't try to treat them without first consulting with your vet. Choosing Your Gulf Coast Box Turtle. Ornate box turtles are not hardy and are not suitable for beginners. They have very specific needs, are very sensitive to stress. and are difficult to keep in captivity. It's advisable to seek out a captive-bred specimen of ornate box turtle from a reputable breeder so as to avoid supporting the capture of wild turtles for the pet trade, which often results in subpar care and sick animals. If you're still trying to decide which is the best pet for you, check out our other box turtle profiles here. Thinking About a Pet Savannah Monitor?